AIDS is an issue that will be, certainly for not too distant future, surrounded by an aura of mystery. Most people understand the seriousness of AIDS and most of the risks that are associated with the disease, but few understand where AIDS came from and how deadly it was when it was in its most erratic form. In this documentary, aptly titled We Were Here, co-directors David Weissman and Bill Weber examine the San Francisco AIDS crisis of the late 1970’s and early 80’s. Like other films of its nature, the directors opt for a talking head style, interwinding various survivors’ stories with archive footage and photographs, allowing intimate and detailed access to the crisis from both a personal and outsider’s viewpoint. Revolving around five individuals’ experiences (Ed, Eileen, Daniel, Guy and Paul), We Were Here is every bit as all-inclusive, heart-wrenching and inspirational as you might imagine. Through these varied testimonials, we are allowed uncensored access to the impact this deadly, almost plague-like disease has had on ordinary people and the people they loved, with a tragic look at how those who survived will forever feel an overwhelming sense of guilt and bewilderment as to how are still alive today. We Were Here isn’t only astonishingly affecting and eye-opening due to the personal accounts, but it’s also incredibly uplifting. 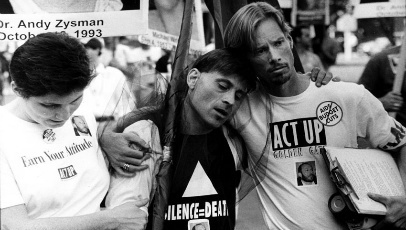 Though some religious or prejudiced minds condemned homosexuality and even called for those infected with AIDS to be put in quarantine, most people were dedicated to showing their support and doing everything in their power to ensure those affected were looked after and cared for. Weissman and Weber bring to light that active sense of community that brought people – especially those associated with the gay community – closer together, even though this unknown, uncontrollable disease was claiming casualties left, right and centre. What makes this documentary so special and such necessary viewing is how honest and open-minded it is and how, even 40 years on, we can still pay tribute to those lost during the diseases’ most rampant time. By opening people’s eyes to the devastation AIDS can cause, it’s possible that lives will be saved and scientists will work harder to ensure as few people as possible have to suffer the pain and suffering as those +15,000 did in the late 70’s and early 80’s.